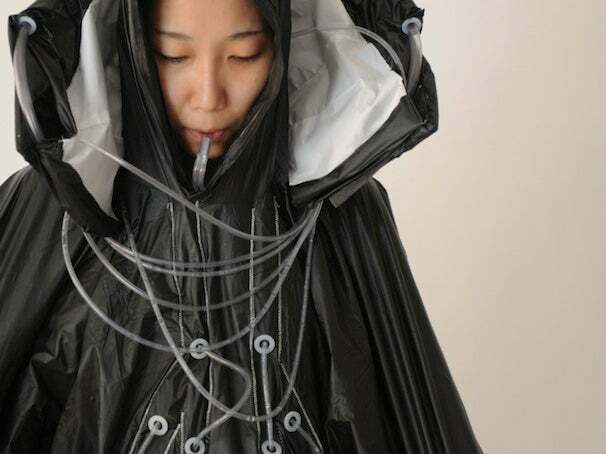 Catching a drink of water isn’t exactly something most would think about doing the next time they're thirsty, but that’s exactly what this nifty water purification rain coat is capable of should it actually become a mass-market reality. The raincoat, named the RainCatch, was designed by CIID students Hyeona Yang and Joshua Noble and it catches rain water while you walk the streets. It purifies the rain water by passing it through charcoal filters; it then stores the water in the shoulders of the jacket. The jacket owner could then use the built in hydration system to take a drink, or save it for later. The jacket may very well be part art, part commentary on the sociopolitical state of fresh drinking water, but in either case, the jacket really illustrates how clothing can be used to help solve actual real world problems. Sure this technology may work better in a knapsack, or camping gear, but in countries where water is scarce, collecting rain water could be the only option for survival. Also, if Joshua's name sounds familiar, it's because he helped design a cool low-tech racing game that we covered a few months ago.